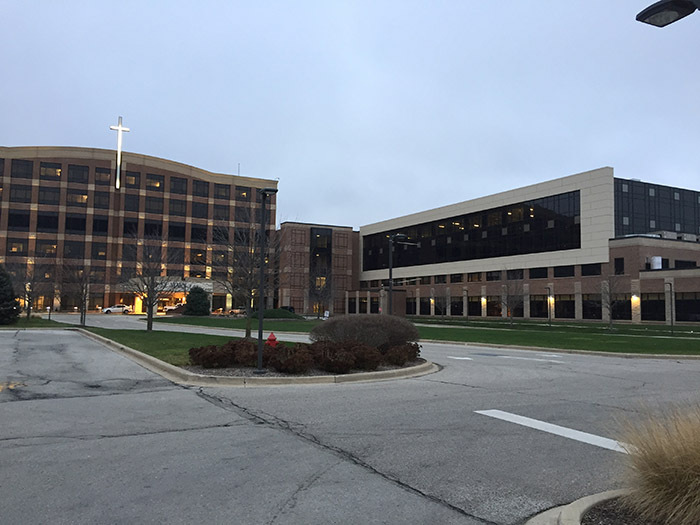 The Surgical Pavilion at St. Mary Medical Center started in the late spring of 2014 and was completed at the end of 2015. The project involved four phases of work: Phase 1 was the shell of the new facility addition; Phase 2 was the second floor build-out, which included the new ICU and mechanical room; Phase 3 was the first floor build-out, which included twelve new Operating Rooms and a sterilization area; Phase 4 was the remodeled area that connected the existing hospital to the new addition. This project was challenging, with system integration with the existing hospital and the need to minimize disruptions to the existing facility during construction. Arctic Engineering was instrumental in the Building Information Management (BIM) process as this project began under a very aggressive schedule. Our team lead worked closely with the Construction Manager to work through conflicts early in the process in order to provide extremely accurate coordination drawings. This enabled us to fabricate the sheet metal, HVAC piping and plumbing piping and to install in some extremely constricted spaces in the facility. This increased productivity as well as eliminated errors and rework, since conflicts were anticipated and worked through prior to installation in the field. Arctic Engineering was responsible for installing seven new air-handling units, four condensing units, a heat-transfer package, equipment air compressor, new plumbing fixtures, domestic water heat exchangers, multiple Variable Air Volume boxes, as well as CRC’s (Critical Room Control units), laminar flow diffusers and medical gas equipment and outlets.